Reply Subj: Has Anyone Seen The Show Comic Men? Stan Lee Explains Doctor Doom, Do You Agree With His Take On Him? I caught an episode a few days ago (I THINK that it was on Wednesday morning.) on AMC. For those who don't know, it's a show that's hosted by Kevin Smith and focuses on his comic book store (Which I've been to a couple of times, as I do like in New Jersey.). Stan Lee came to the store and a customer wanted to buy a really old and expensive issue of the FF that had Doctor Doom. Stan was explaining that he didn't view Doom as a bad guy, that he basically thought that Doom was more of a nobleman. I can't remember his exact words, but the gist of it was Stan explaining that Doom wasn't really a villain. I think that they were trying to get the customer to pay more for the comic (I'm pretty sure that it worked! It sure would for me, too. ), but it seems like quite a few writers and fans agree with this. What do you guys think? He has been written this way a few times. I myself prefer a more villainous Doom (But one who does have at least what he considers to be a code-of-honor.). I don't prefer him to be sadistic, the same way that Carnage or the Black Mask are, but I do prefer him to be more on the ruthless side. But I certainly see the appeal of the other take. And if Stan said it, then he must be right. I do remember a story from the Stan and Jack era where Doom was willing to bomb his people though, so that does seem strange. 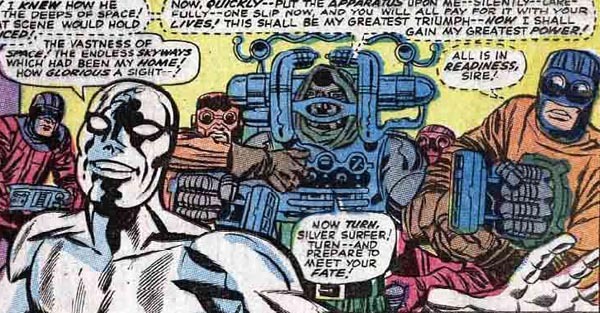 ... especially, when Doom stole the power of the Silver Surfer. He made Doom behave like an aristocrat, that's true, but a noble man ? Hmmm, it is probably like when he compared Magneto to Malcolm-X. Actually, it was Chris Claremont who made Magneto a revolutionary mutant rights fighter. During the Silver Age, Magneto behaved like a mutant supremacist.